Details of some of Hubert von Herkomer's student artists. The page will be extended over time. Hubert von Herkomer founded the Art School at Bushey in 1883. In its 21-year life the Art School attracted some 500 students to the area, some of whom stayed after establishing their own studios. To read more about Herkomer click here. 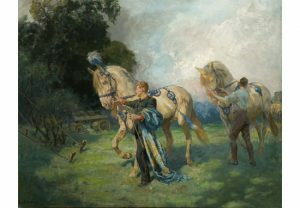 Lucy Kemp-Welch was the foremost painter of horses of her time, especially of working horses. She was an expert horsewoman with an innate feeling for horses and knowledge of their anatomy, and her work constitutes a record of some almost vanished breeds. Her works are in many public collections in Britain, including Tate Britain and the Imperial War Museum, and also in Australia, New Zealand and South Africa. The Museum includes an exhibition of many of her paintings. The works show wild ponies running spiritedly across Exmoor; well-groomed polo ponies galloping after the ball; the last horse-launched lifeboat being pulled into a boiling sea; the great Hanoverian creams of Sanger’s Circus parading with majestic gait; huge heavy horses pulling felled timber or a circus caravan on the move; hard working farm horses trudging home at the end of the day, their coats glistening in the low evening sun. Not least there is a row of horses of all sizes, colours and disposition, from thoroughbreds to the lowliest carter’s horse, standing tethered to a rope barrier, patiently, restlessly or with aristocratic air. See more about the Lucy Kemp-Welch Gallery here. Frank Gascoigne Heath was a student at Herkomer’s Art School from 1897 to 1900. He then moved to Cornwall (Newlyn, Polperro and Lamorna) where he lived for the next 35 years. There is an impressive website www.frankheath.com which includes illustrations of around 100 of his works, including “St. 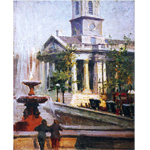 Martins in the Fields Church” which he painted while he was a student at the Herkomer Art School – click here to see more about this painting. On the reverse of the painting is written the address ‘6 Chapel Studios, Bushey, Herts’. Frank was very versatile in his range of subjects and his style changed after the Great War when his palette became much brighter and when he was known locally in the 1920s as “the sunshine artist”. Thanks to Hugh Bedford for this information.